Lip augmentation is performed in order to improve and enhance the appearance of your lips. 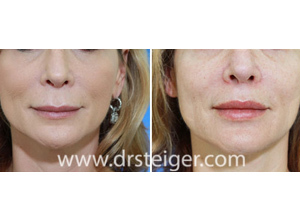 Since the lips are a defining characteristic of the face, lip enhancement is a commonly performed procedure. The majority of methods for enhancing the lips are non-invasive and minimally invasive, meaning that they are non-surgical. With an artistic eye and using advanced techniques , lip augmentation will appear completely natural. In order to achieve the best and most natural outcomes, an artistic approach must be utilized. 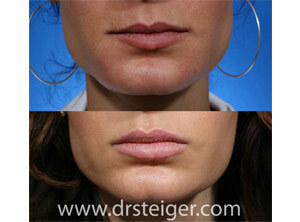 Dr. Steiger will perform a thorough analysis of your lips and recommend the best treatment for you. Each lip augmentation procedure is customized to our individual patients. This ensures the best possible results. To enhance the appearance of the upper and/or lower lips. Lip injections are performed with FDA approved fillers such as Restylane, Perlane, and Juvederm. 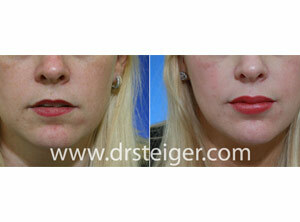 Dr. Steiger chooses which one will be best to achieve the most natural appearance. Topical creams and local anesthesia is used for a painless experience. On average, the procedure takes between 15 minutes to 45 minutes. You may go back to work and normal activities immediately after the injection. There are no physical restrictions. The lips will swell after the procedure. This takes several days to resolve. Some bruising is possible, but may be covered with lipstick immediately. The use of ice is encouraged to reduce the amount of bruising and swelling after the procedure. We recommend performing the procedure no sooner then a week prior to any big social events to allow for all of the bruising and swelling to resolve. Strict adherence to our post injection care protocol will ensure the fastest possible recovery.